Snow three feet deep. Black ice on the roads. Annual temperatures that would fluctuate between winter lows of -15 F and 105 F in the summer. I was so tired of dealing with it. No one’s handing out extra credit points for living where the climate makes daily living a challenge. With a go-anywhere income, as s a writer, I can live wherever I have an internet connection. So, I decided I would rather be challenged by the adventure of learning a new culture in a new country, than dealing with snow and ice. After researching a dozen different countries, I was drawn to the description of Ecuador as the “Land of Eternal Spring.” If I were going to the trouble of moving, I wanted climate perfection. I was looking for a beautiful life and found it in southern Ecuador. 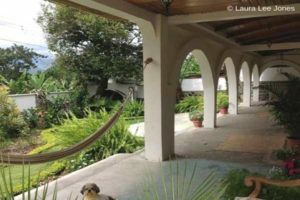 I bought property on the outskirts of a little mountain village, within easy driving distance to the city of Loja, and I love it. The year-round growing season lets me indulge my love of gardening as I never could with the 90-day growing season I had in Washington State. My ferns are over 12 feet across and the fronds unfurl five feet into the air. In the citrus grove behind my home, a frequent sight to see is white citrus blossoms, small green fruit, and ripe, ready-to-pick oranges, mandarins, lemons, and limes on the trees all at the same time. The cost of living is less if you have a First-World income. Instead of paying over $2,000 annually for property tax, I now pay less than $150 (which is still more than a lot of people pay, because my property has three houses on it: a main house, a guest cottage, and a worker’s house). A typical meal in town at an average restaurant runs about $3.50. A nice meal (with super-sized servings) runs around $8. Taxis are cheap and plentiful. Before I bought a car, a taxi to my home in the country was just $10. Since buying a car, gas has stayed at $1.48 a gallon. And roses… At $4.50 for two dozen, I have roses in the bedrooms, roses in the dining and living rooms, and roses in the front entry hall. I love earning a living with a go-anywhere income, where I get to set the pace of my life. Because the weather is so mild, most of my work is done outdoors. I have several places I like to write. Early mornings, I’ll take my laptop to the little wrought-iron table in my courtyard and write while the coffee steams and the sun rises over the mountain peaks across the valley. Later in the day, I have a spot on the shady verandas where the breeze carries the scent of gardenias, roses, and jasmine. What a difference from my closed-in office in the U.S. where I was always inside because it was either too hot or too cold. The thing I love most about my life now is how calm, peaceful and slow-paced it is. If I want a change of scenery, I can pack a bag, grab my computer, and go to the coast for a week or a month. After five years in Ecuador, I have never once regretted moving here.